Please click here if the email below is not displayed correctly. 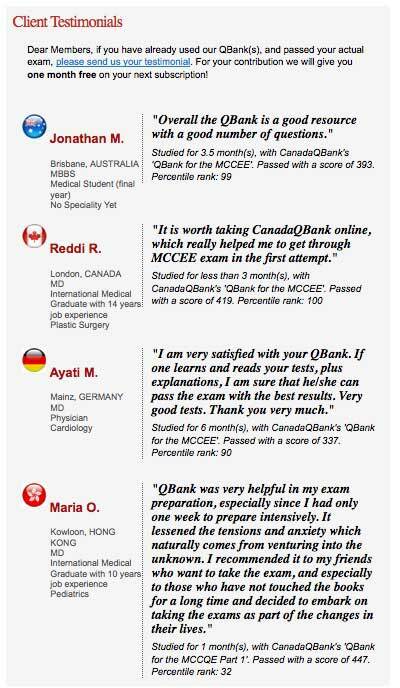 Read numerous Testimonials from users of CanadaQBank.com who have taken the actual Medical Council of Canada exams and passed! Click HERE to view all the testimonials. 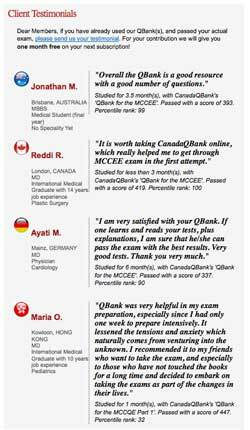 If you have already used our QBank(s), and passed your actual exam, please send us your testimonial. For your help we will give you one month free on your next subscription! Please fill out the Testimonial form. 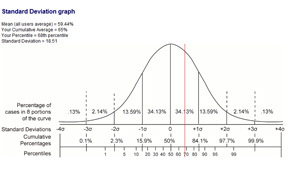 This graph analysis will provide standard deviation and percentile information. 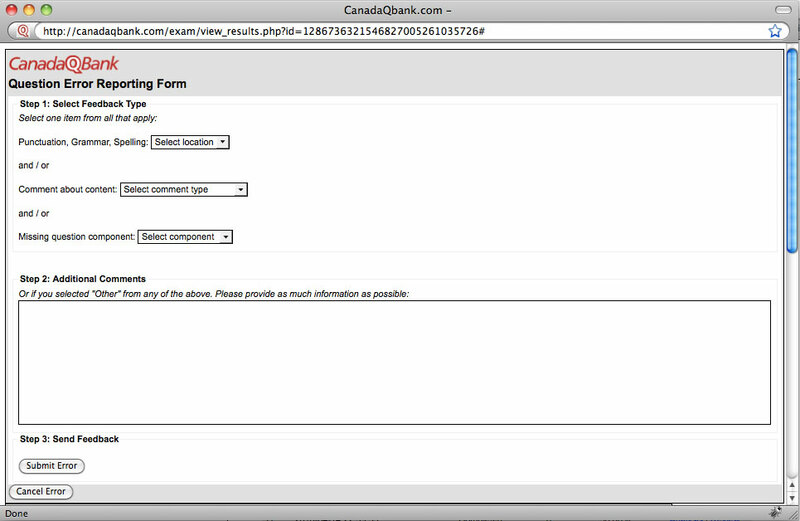 It will allow users to see exactly which percentile they place in, as compared to all the other users of CanadaQBank.com. 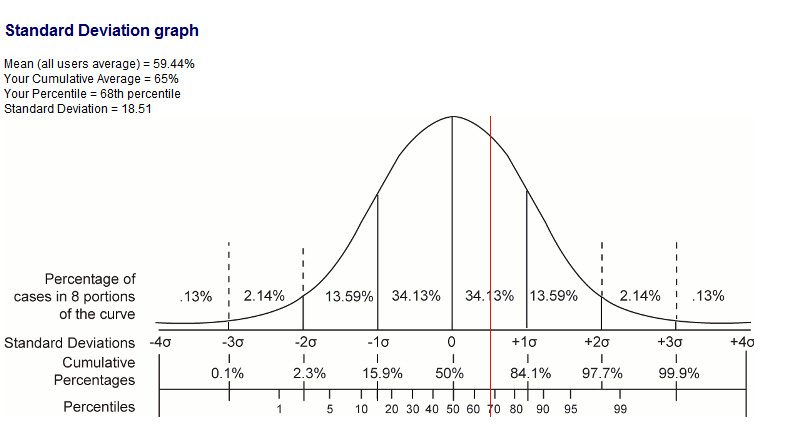 For example, if you are using the QBank for the MCCEE and have a cumulative average that is one standard deviation above the 'all users average (mean)', you will stand at the 84th percentile. This implies that 84% of persons who used the QBank for the MCCEE scored lower than you on the questions contained in the QBank for the MCCEE and 16% of persons scored higher than you. 3) Average score for each question. 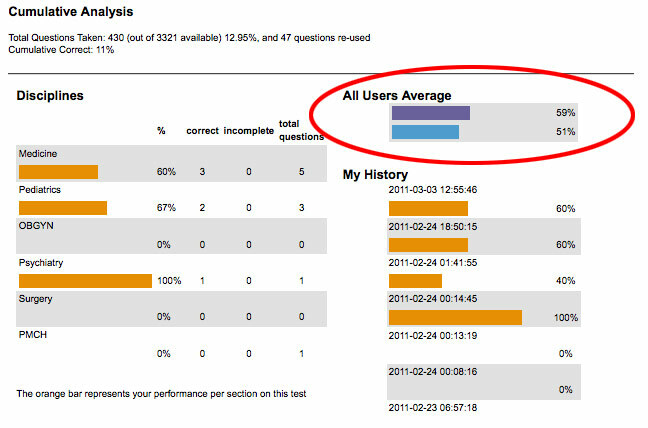 When a user takes a test, the system will now calculate the overall average of all the questions in that particular test, and compare it to the users performance. This way you can compare your performance to all other users of the QBank. For example, say you create and take a test that has 50 questions and score 70% on those question. The system will also show the overall average of all users of the QBank specifically for the questions that this exam consisted of. The analysis page will show: The blue bar represents the overall average performance for all users of this 'QBank for the MCCEE' specifically for the questions that this exam consisted of. 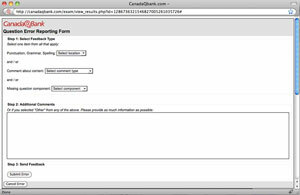 Full HTML emails will be sent to all users who sign up to CanadaQBank.com, receive coupons from us and subscribe to a QBank. Each email will contain your login information, links and details about all of the following features that CanadaQBank.com has to offer: information about Our QBanks, Our Videos, FAQ Section, Forum, Facebook Group, Newsletters, Newest Features, Careers with CanadaQBank and CanadaQBank.com user Testimonials. 5) Rate this question. Scale 1 to 5. 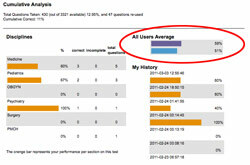 We have created a new system that allows users to rate a question by choosing between 1 and 5 stars. This appears in the answer and explanation section when the user is reviewing a test. 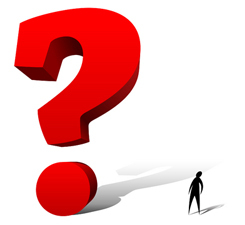 This will allow us to see which questions are the ones to keep and which ones are in need of improvement. We will then periodically either modify and improve the lowest rates questions or delete them entirely. We will, of course, add fresh new questions to the site, to replace any low rated questions that we delete. 6) New Error Reporting System. We are not perfect. But you can help us in achieving perfection. After you take a test, please click on 'Review'. You will then see in the top left corner a link named: 'report error'. Click on that and fill out the cool new form! Users now have the ability to strike out answer options as they are going through the questions in Tutor Mode. There are general steps that IMGs should take before arriving in Canada, and steps they should take after their arrival. Confirming that your medical degree is from a recognized medical school. Taking an online self-assessment exam. Submitting your credentials with the Medical Council of Canada's (MCC) Physician Credentials Repository. 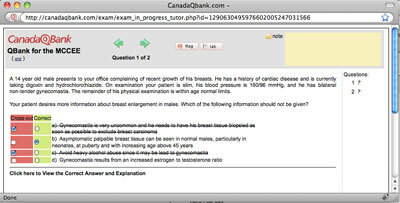 Taking the Medical Council of Canada Evaluating Examination (MCCEE). Visit the International Medical Education Directory (IMED): http://www.faimer.org/resources/imed.html, part of the Foundation for Advancement of International Medical Education and Research's (FAIMER) website. Your medical school, the name of the medical degree and the year of your graduation must be listed on the FAIMER International Medical Education Directory to be accepted in Canada. 2. Are you exam ready? IMGs who take the SAE - EE will receive the number of questions correctly answered as well as a percentile table that compares their performance to the results achieved by other MCCEE candidates. IMGs can use the MCC's Physician Credentials Repository to establish a confidential professional electronic portfolio of their credentials prior to arriving in Canada. IMGs can request that the Repository share their portfolio with provincial/territorial medical regulatory authorities, certifying and qualifying bodies. The MCC requires IMGs who are applying for the first time to the MCCEE to open an application with the Physician Credentials Repository and send a certified copy of their final medical diploma. The diploma must be successfully source verified through the Repository for the candidate to be eligible to the Medical Council of Canada Qualifying Examination (MCCQE) Part II. Fees: To open a Repository account, IMGs are charged a one-time account fee of C$250. C$100 is charged for each of the first four medical documents submitted for source verification. C$60 is charged for each subsequent document. Note: Document fees are in addition to the account fee. If IMGs have obtained Canadian or American board specialty certification, they may apply to the Medical Council of Canada for an exemption from the MCCEE. Fees: First-time MCCEE candidates are charged C$1,500; C$1,300 is charged for IMGs who reapply for the MCCEE. Note: The MCC requires all first-time MCCEE candidates to open an application with the MCC's Physician Credentials Repository and send a certified copy of their medical diploma. All provinces have the right to request additional assessments to qualify for residency positions in their province. These assessments may include the National Assessment Collaboration Objective Structured Clinical Examination (NAC OSCE): http://www.mcc.ca/en/NAC/NAC_examination.shtml which is only administered in Canada. Candidates must take the MCCEE before being eligible to take the NAC OSCE, and certain jurisdictions may add region-specific eligibility criteria or may require the Medical Council of Canada Qualifying Examination Part I for certain provincially funded training positions. 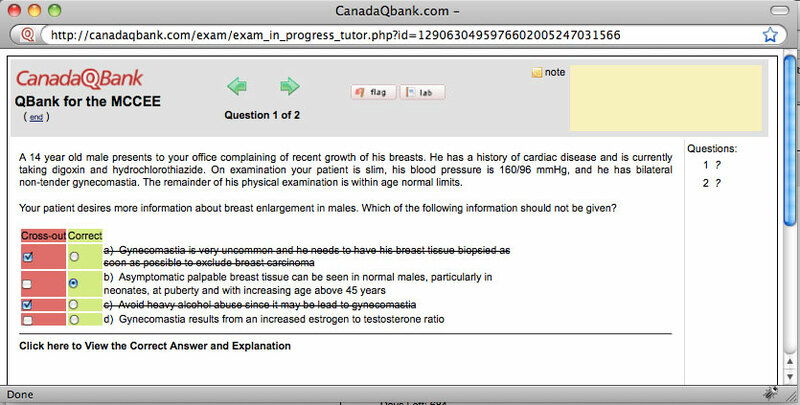 IMGs may be required to pass the Medical Council of Canada Qualifying Examination (MCCQE) Part I: http://www.mcc.ca/en/exams/qe1/ and Part II: http://www.mcc.ca/en/exams/qe2 (additional fees apply). Candidates may also take a self-assessment exam to help prepare for the multiple-choice component of the MCCQE Part I. This self-assessment is offered over the Internet and can be completed prior to arriving in Canada. The MCCQE Part I and the MCCQE Part II are administered in Canada and are the same requirements for graduates from Canadian faculties of medicine. All jurisdictions also require a minimum of two years of postgraduate training for licensure. When IMGs pass the MCCQE Part II, they are awarded the Licentiate of the Medical Council of Canada. 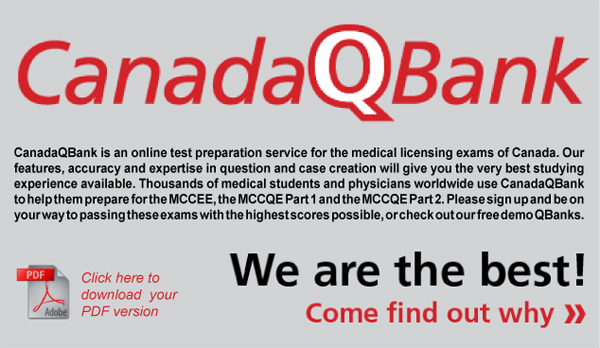 We are confident that our QBanks will provide you with the very best preparation for the Medical Council of Canada licensing exams. Each QBank consists of classic, simulated multiple choice questions and/or cases designed to reflect the content of the MCCEE, MCCQE Part 1 and MCCQE Part 2. Online subscriptions for a 1, 2, 3, 6, 9 or 12 month period can be purchased to access these questions. Additional extensions can be purchased also. 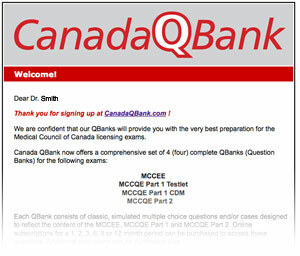 If you are preparing for the MCCEE, the MCCQE Part 1 or the MCCQE Part 2 we recommend a 3-6 month subscription to the corresponding QBank at CanadaQBank.com. We have found from feedback from medical students and physicians that this works best. The key is to do the questions repeatedly, at least twice, but preferably three times. Also read the explanations very carefully. This will help you master the topics. Take a look at your exam analysis to see which subject areas you are doing weakest in, and concentrate on improving on those during your revision period. Suite 200, 1559 Brunswick St.
CanadaQBank is not affiliated with the Medical Council of Canada (MCC). The MCCEE, MCCQE Part 1 and MCCQE Part 2 are trade-marks of the Medical Council of Canada (MCC). None of these trademarks are held by CanadaQBank.